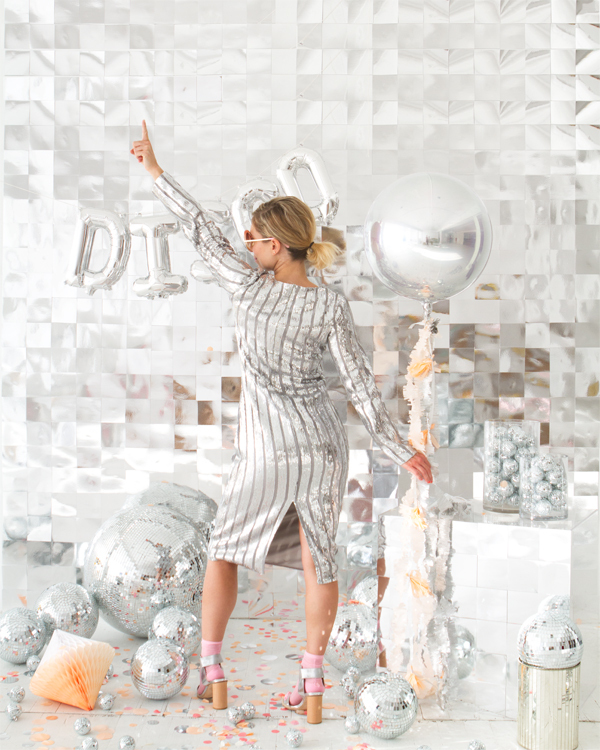 Well I hope you like shiny things because this photobooth backdrop is the sparkliest thing ever. We were recently in New York City and visited Doughnut Plant which has a disco ball bathroom. I got so inspired! I thought it would be fun to create a photobooth backdrop out of mirror board. 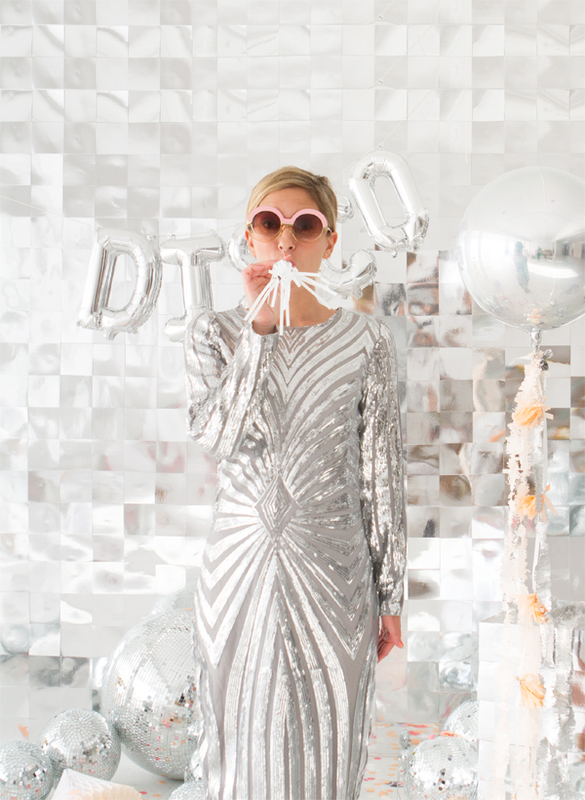 This would be fun for New Years Eve or just for any sparkly event. 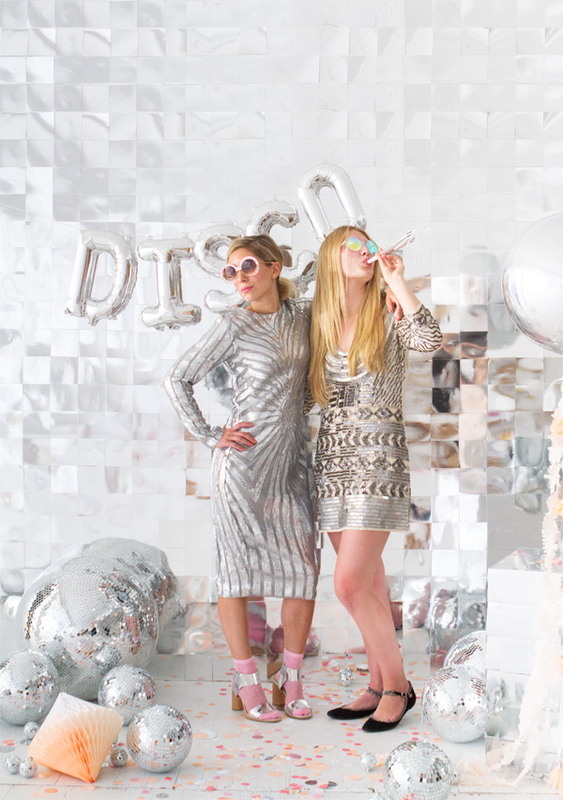 The little mirror squares on the wall mimic a disco ball and we added lots of shiny props and of course…disco balls. My favorite color is definitely shiny! Step 2: To cut either use an exacto and cut a few sheets at a time or we had a friend with a cutting machine do it and it took 15 minutes. Step 3: Lightly draw a vertical line on the wall with pencil. You’ll use this line to guide you when positioning the individual pieces. Step 4: Apply a loop of gaffers tape to the back of each square and stick onto the wall until the wall is filled. Step 5: If you have extra mirror board, you can cover props! We decided to make a disco box. It looks so fancy, I totally love it! This looks so fun! Also, where are the dresses from?? They look amazing! that dress!!!! where can i find it?